I suspect the attempted sellout of the cultural area by BLM was intended to provide an excuse to ignore future OHV non-compliance on Juniper Flats, including the hot springs routes. What is left to protect when you have just relinquished the heart of an area? 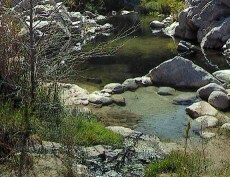 Closing this illegal trail will require BLM law enforcement to maintain presence and that will benefit the hot springs. OHV Access across Juniper Flats ACEC?